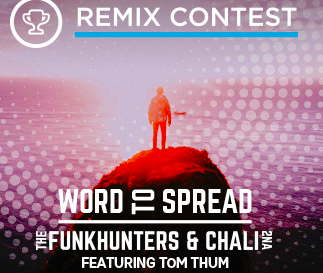 We’ve teamed up with the Funk Hunters to bring you a killer remix contest! This time it’s for “Word To Spread” – a dope 85bpm, F# minor hip hop / electronic track written in collaboration with the legendary Chali 2na from Jurassic 5. With 2na’s baritone rapping and Tom Thum’s soulful r&b hook these stems are fire, so take advantage! If The Funk Hunters, Chali 2na and Westwood Recordings like your remix then you could win some dope prizes including: official release on Westwood Recordings, Universal Audio Apollo Twin MKII Duo (courtesy of HHB Canada), SUBPAC M2, iZotope plugins and more! This track can be taken in many different directions, so download these high quality stems today and show them what you got! The winners will be selected by The Funk Hunters, Chali 2na, Westwood Recordings & SKIO Music during the judging period. Employees of The Funk Hunters, Westwood Recordings, Chali 2na, Tom Thum, SKIO Music & related parties are ineligible. You can edit and resubmit your remix on SKIO until the last minute on Mon. Mar. 20!